As we have written here in an earlier post – Jubilate Agno was the result of an overwhelming day for us in one of Britain’s most spectacular libraries: spectacular in its physical buildings but also in the astonishing collection of books and archives housed there. 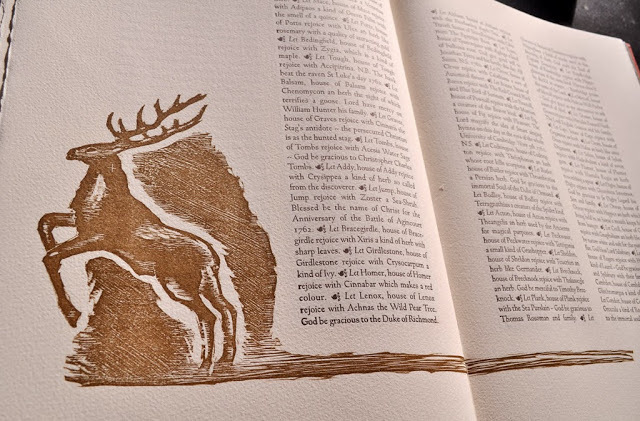 The joy at being able to turn the pages of Eton College’s Gutenberg Bible and observe its printing and decorations at close hand sent this printer rushing to pay tribute to the experience in a book from our press. Christopher Smart’s Jubilate Agno seemed an appropriate choice of text and in conversation with Angela Lemaire, with whom we have collaborated on so many occasions, we discovered a shared pleasure. She was eager to create images which would pay tribute in similar manner to the early decorators of the Gutenberg. When the woodcuts had been cut and the printing of text and imagery had finally been achieved here, it became a stunning book. 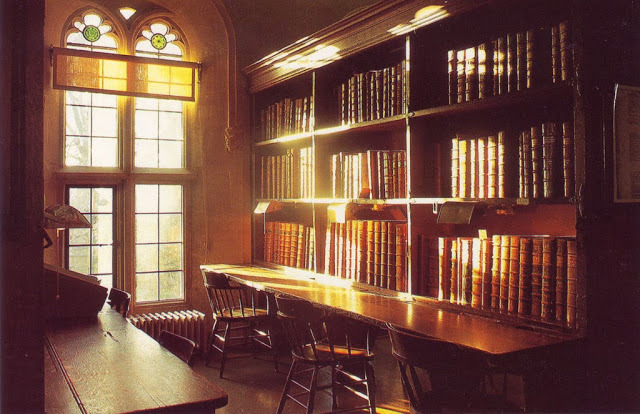 The Library at Eton was delighted with their copy and the book has been bought by many other institutions and individuals. Last Saturday, however, saw the book in august company once more. 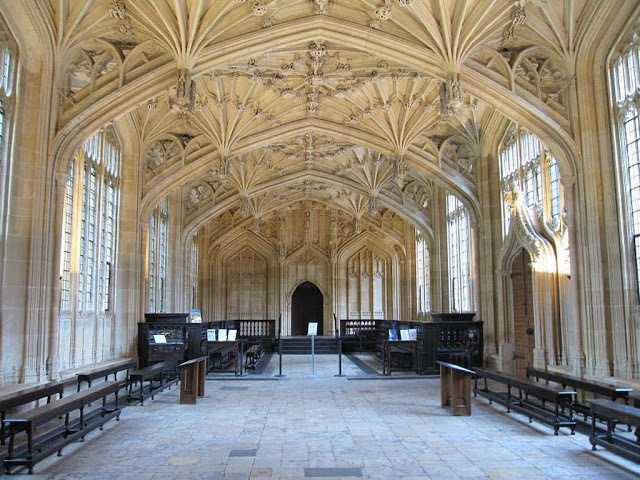 The Bodleian Library had bought a copy and had then selected it for an important event in their calendar . . . when they invite Friends of the Library to a fundraising event to view some of their recent acquisitions and to sponsor individual titles. 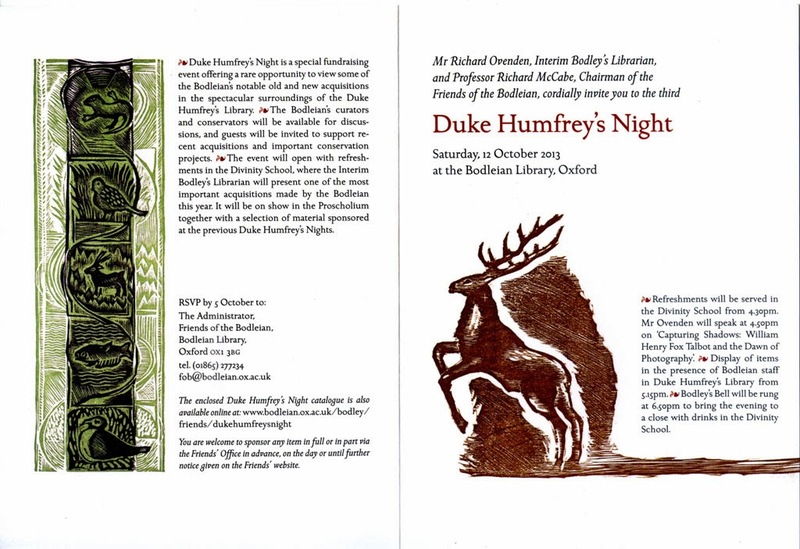 Called Duke Humfrey’s Night, a reception takes place first in the Divinity School alongside the Radcliffe Camera and the Sheldonian . . . glorious Oxford architecture. 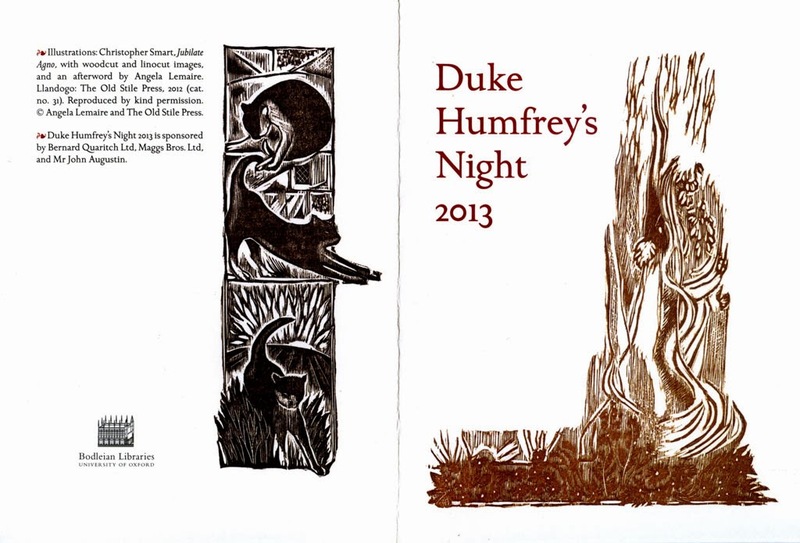 The designer of the invitation to this event had asked if he could borrow some of Angela Lemaire’s imagery – but then followed the design of the text as well. There was also a catalogue of the acquisitions which the Friends were being asked to sponsor – with the ‘alpha’ and ‘omega’ from Jubilate Agno on the covers and within. We were all delighted by such a prominent honour, and indeed to have been asked to join the event – Angela coming south from Scotland and we heading east from Wales. 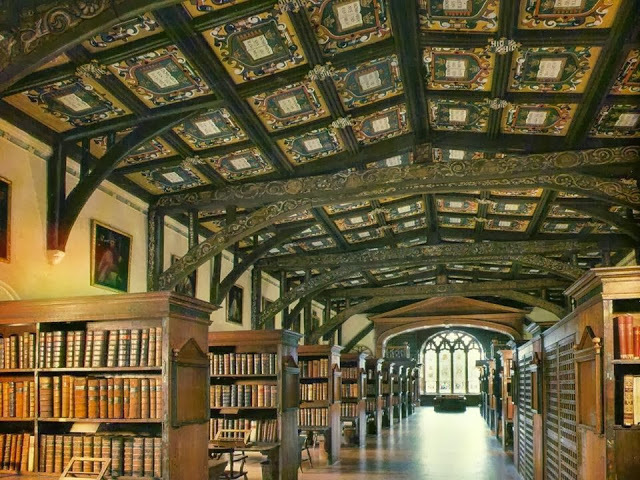 All the acquisitions were laid out in Duke Humfrey’s Library, each with a member of the Bodleian staff to elaborate on the catalogue details and show off the particular aspects which made it important to the Library’s collections. So, alongside eighteenth century travel diaries, family and military journals, rare printing, music, an oriental woodblock, papyri requiring considerable conservation and ephemera, Jubilate Agno was displayed in one of the ‘cubicles’ created by the shelving. We met many enthusiastic ‘Friends’, including those who had ‘sponsored’ ours, and it was wonderful to talk with the now 90 year old Colin Franklin who remains as lively a bibliophile as ever. Richard Ovenden, Interim Bodley’s Librarian, spoke to the assembled company about an archive of Fox Talbot and early photography and, later, was similarly talking of his delight in handling Jubilate (and in receiving details about Old Stile Press books). It was an evening that will remain in our memories alongside that day in the Eton Library with Michael Meredith. P.S. Sadly I cannot say that we met these earlier visitors to Duke Humfrey’s Library – at Hogwarts, no doubt! Sounds wonderful, wish I could have been there. Would have been nice to say hello to Colin Franklin too whom I haven't seen for many years. Bravo and jubilations for the Jubilate in these marvellous surroundings.